The new Launch Grand Touring Edition. The turn of the model year is always an exciting time for RVers. New models are rolling out of manufacturing facilities and snowbirds begin making plans for their southern destinations. While many of these new models are not officially available until early January, many are ready sooner than later. According to Nick Eppert, vice president of sales and product development for Starcraft RV, which just released three new model segments in its Launch series, this is an ideal time to introduce new products as dealers – as well as consumers – are considering their new buying options. Starcraft also offers its Solstice Fifth Wheel brand for 2017. According to Starcraft, the models in the series include The Launch Mini, The Launch Ultra-Lite and The Grand Touring edition. All designs cover three weight and competitive price categories. For instance, the seven-foot wide Mini ranges in weight from just under 3,000 to a little more than 3,000 pounds. It’s comes in six floorplans and the company says it’s available in a non-slide, hybrid design, and new slide model. Consumers will also appreciate the redesigned Launch Ultra-Lite. This entry has a new exterior design and series of interior appointments across its nine-floorplan line up. Rounding out the new Launch segments is the Grand Touring Edition. This is the flagship of the series with high-end appointments, a towing-friendly lightweight design and competitive price point. With a long list of features and options, the Touring Edition is available in two different tri-tone fiberglass sidewalls. There is also full front cap color options. Interior standards include solid surface countertops, hardwood raised upper cabinet doors and an eight cubic-foot refrigerator. Another new segment from Starcraft for 2017 is in its Solstice Fifth Wheel brand. 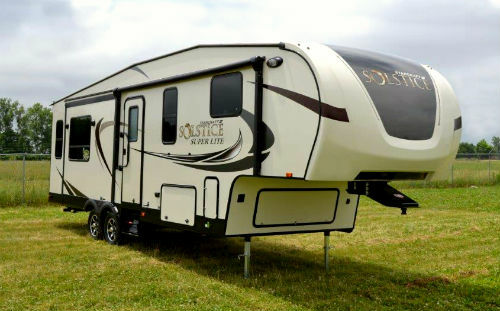 The Solstice line-up will now include the Solstice Super Lite, Solstice Lite, and the flagship of the series, Solstice. During the Hershey RV show Starcraft impressed me the most. Almost bought a new unit. I was looking for a TT to pull with my Silverado. Starcraft’s prices (Camping World) were reasonable. But I wasn’t looking for outside entertainment centers or bunkbeds. Just a hookup and go, lightweight nomad TT. Model 22BUD TT almost fit the bill perfectly. But a couple things changed my mind. A plastic kitchen sink? This model had a wrap around dinette. But the table legs would not let us pass to sit at the couch/bench. Probably wasn’t setup correctly? Then the pricing. $15,8. Plus dealer prep. TT tour, new battery, etc. $1785. What? Tax. 6%. Unavoidable. Tags, transfer, title fees. Total ~$19+K. So I said, $20,1 is the list. My total is almost as much, seeya. Did I mention almost all TT and MH interior upholstery is now vinyl or leather? Happy shopping to everyone! That Launch Grand Touring Edition model kind of struck me a bit. Always thought of Starcraft as a low end builder. So when I came across this article it had me digging deeper on what the spec’s were. I’m looking for a higher end tt in the 25′ to 29′ (30′ ?) Looking at pictures posted on dealers websites, at first it had that Arctic Fox Classic exterior look, but once inside it looked rather drab. But, without a in person look / see I’ll give the new line a chance. 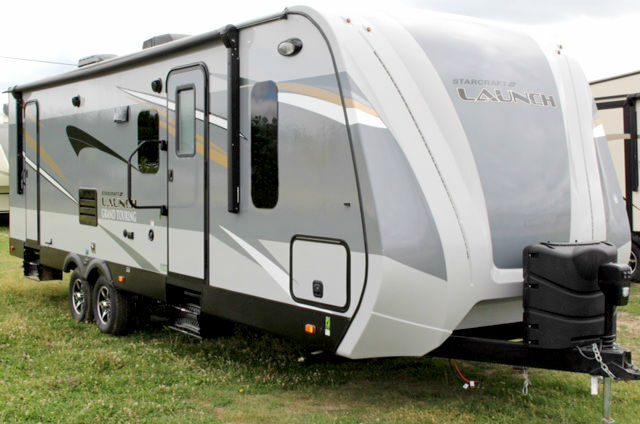 Went on the Starcraft website and they didn’t have anything info on this new line of RV’s. Hum?…. Was trying to find spec’s about this RV. I believe there are 2 floorplans from doing a Google search. Called 2 dealers and even Starcraft, and all 3 didn’t have a single spec number about the unit. No length, no weight, no water tank size….All said they would call back when they found out. Obviously there are units on the market. I’m a little dumb-founded that you go ahead design and build a new line of RV’s, get them to dealers and not have it listed on your website. One dealer said “it’s a medium sized” Rv trailer. Looking for something along the lines of Winnebago, Arctic Fox quality wise. Well made cabinets, healthy sized water tank, molded front cap, decent sized shower and dedicated sleeping for 3 adults all in a sub -30′ length.